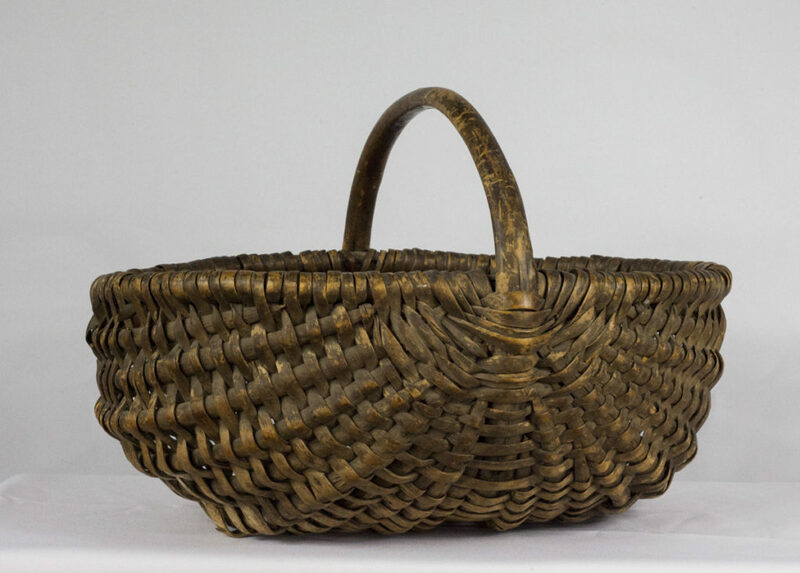 This basket is a surviving example of the “make-do” attitudes of rural community members around the turn of the 19th Century. By using local resources, they created unique, artistic home decorations with lasting sentimental value. At the same time, the larger British and American Arts and Crafts movement heralded such artistic production to bolster the ideal economic and moral health of these communities. Such sentiments survive in today’s non-professional, Do-It-Yourself culture and professional crafts, which market the decorative appeal of rustic furnishings and home adornments. A resident of Middleton, Henry Haberland made this basket from willow branches that he gathered from the creek that runs all the way to Lake Mendota. He made the basket for his daughter, Elsie Grinde, a resident of the Springdale Township in Dane County. The basket shows a great deal of wear at the bottom suggesting that it was well used throughout the years and thought the woven branches have also darkened significantly with age, the chevron design on both sides of the basket are still bound tightly so we can continue to appreciate his craftsmanship today. The basket stayed within the Haberland family for generations and was eventually left to Marilyn Grinde, the donor and Elsie Grinde’s daughter-in-law, or Henry Haberland’s great-grandson’s wife! Today, many of us are used to quick ready-made products and a basket might seem to be a humble thing; but, Haberland’s basket is a testament to the nineteenth-century rural Wisconsinite’s self-sufficiency and ingenuity because he used his skills and nearby resources to create objects that were kept by family members for generations.